Optical projection tomography (OPT) image of blood vessels in the brain. Blood vessels in the liver, imaged using high-resolution episcopic microscopy (HREM). 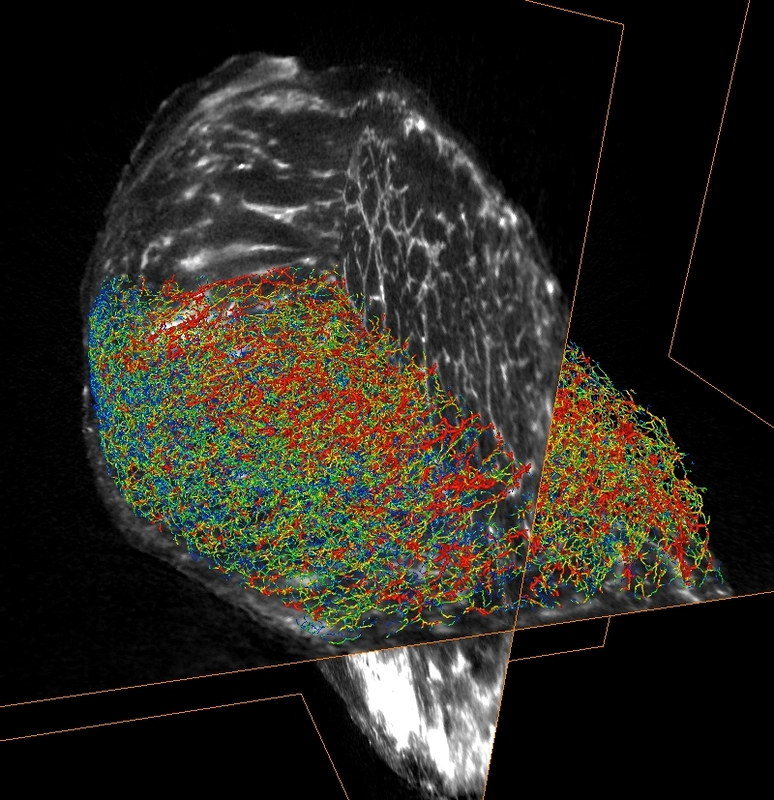 The Cancer Imaging Group (CIG) within the UCL Centre for Advanced Biomedical Imaging combines novel and state-of-the art biomedical imaging techniques to better understand and quantify the tumour microenvironment. We aim to develop new techniques for measuring a range of key characteristics of tumours, noninvasively. Using new approaches in magnetic resonance imaging (MRI), we are developing methods for quantifying cell size and the three-dimensional ordering of cells and blood vessels (using VERDICT-MRI). Likewise, we are investigating the use of MRI acquisitions that are sensitive to flow to measure both convection through the interstitium (and the build up of fluid pressure that this can cause) and blood flow. Combining this with techniques such as magnetic resonance elastography (to measure tissue stiffness), quantitative susceptibility mapping and contrast-enhanced MRI, we can form a detailed portrait of the tumour microenvironment, without the need to invasively sample the tissue. Each of these physiological measurements can also impact on the delivery of anticancer agents to tumour tissue. A key component of our work is to investigate how easily different drugs penetrate into tumours. By combining data acquired in living organisms with high-resolution data acquired after the tissue has been surgically removed, we aim to better understand the imaging techniques that we use, and to provide a more complete picture of the disease process. We are actively exploring new three-dimensional microscopy techniques to complement our in vivo techniques. This includes high-resolution episcopic micrscopy (HREM), optical projection tomography (OPT), lightsheet microscopy and conventional fluorescence and brightfield microscopy. Our sensitive, three dimensional imaging technologies allow tissue structure and function to be imaged at high resolution (up to 0.75µm) and across large volumes, even up to the scale of whole organs. This type of data is used to computationally simulate physiological processes (e.g. blood flow, oxygen delivery), alongside providing a test bed to trial new hypotheses in cancer therapy. In collaboration with other researchers at UCL, we are developing mathematical models to quantify the tumour microenvironment, and to simulate drug delivery. A key aim of developing and understanding new imaging technologies is to ultimately translate them into the clinic. Specifically, our MRI techniques are being actively trialed in cancer patients, and their use in the assessment of anticancer agents is being investigated.